A great source of protein, Pureliving Organic Sprouted Quinoa Flour also contains 8 essential amino acids. Although called an ancient grain, quinoa is actually a seed, and is considered to be one of nature's most complete foods. Sprouted Grains, made from organic whole grains, are considered to be an essential part of a healthy, nourishing lifestyle. These raw, sprouted products provide beneficial nutrients with the flavorsome taste of organic whole grains. Pureliving Sprouted Quinoa Flour contains 28g of Whole Grain per serving and is Certified Organic, Gluten Free, Kosher, Non-GMO, and Raw. Pureliving is dedicated to providing whole foods, while utilizing appropriate technology to preserve the very best nature has to offer. As such, the grains are sprouted, dried, and milled at low temperatures (65-110ø) to maintain enzymes, vitamins and minerals. 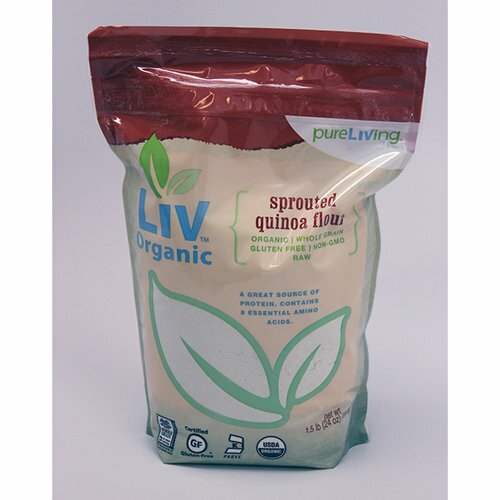 If you have any questions about this product by LIV Organic, contact us by completing and submitting the form below. If you are looking for a specif part number, please include it with your message.